Considering that I am heavy into some heavy quilting these days (no rest, no new starts!) I thought it only appropriate to share some details from my Oh Canada! quilting. These details got washed out in the photography when shooting a white background on a snowy day. Hopefully you get the idea here. Love the way the Aurifil 50W in white made such tiny stitches on that white background. 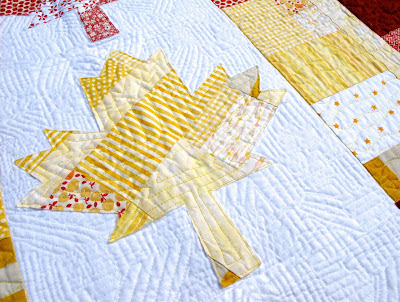 The quilting pattern was completely inspired by Carolyn Friedlander and her intense machine quilting. 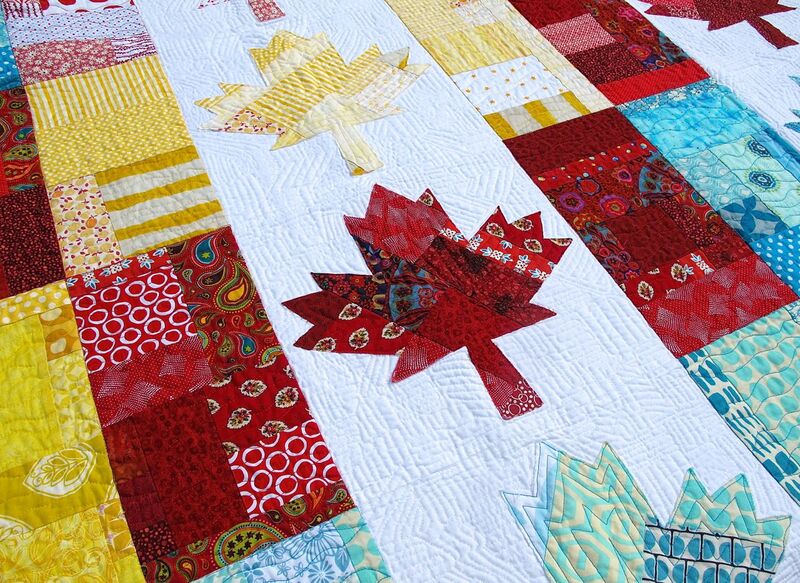 It was perfect for filling the space around the maple leaf and not difficult to do at all. The leaves were done with an outline - that also held down the edge of the appliqued leaf - then echoed inside the leaf. The sides of each flag were stitched in the ditch and then covered with wavy lines. Totally intense and worth every minute of effort. From the back you can get some idea of the stitching too. I intentionally picked this favourite fabric in hopes that it would hide the changes in thread colour. You see it if you're looking for it, but otherwise things just look quite nice and textured on the back too. The pattern for Oh Canada! is going to print this week. PDF patterns available shortly. In the meantime, locals can sign up for a class on how to make the block. this is the perfect quilting/patchwork pairing. been trying to decide how densely i prefer quilting to be and, of course, it depends on the top. i definitely need to learn fmq, though. yours looks great! Hooray for a maple leaf quilt with the right number of points on the leaves!!!! I love this quilt.. I will buy the pattern. :-) So many compliments at the quilt show last week on this one! 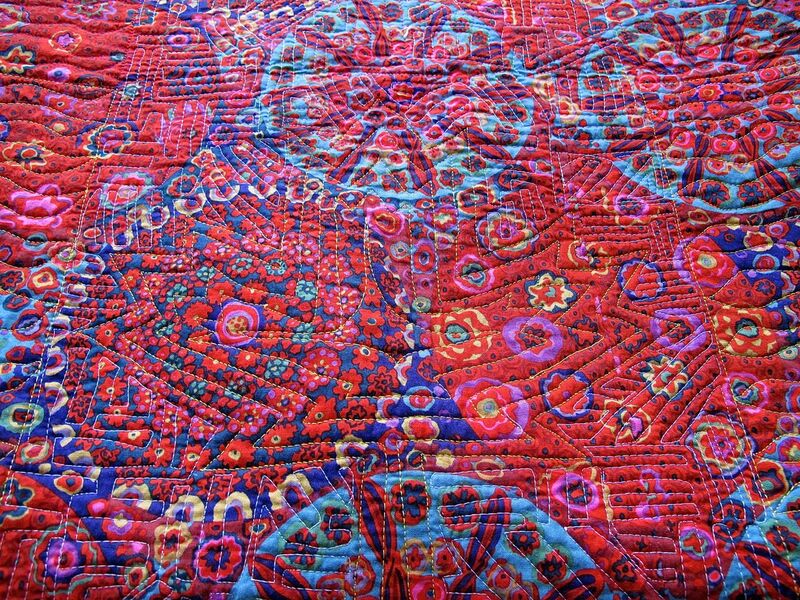 That is wonderful, dense amazing quilting that really enhances your piecing! Gorgeous! The quilting on this is so inspiring. I really like how the maple leaves are stitched down as well. 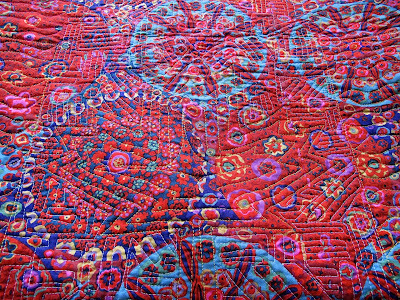 Beautiful quilt and amazing quilting. Lovely quilt! Totally inspired by your MQing too. And it's anatomically correct too, lol! Looks so FANTASTIC! whoop whoop! Can't wait to purchase one of your patterns too.